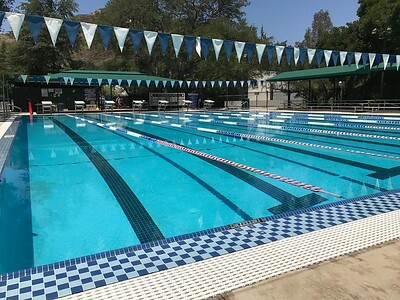 The Calabasas Waves are a competitive age group swim team that is affiliated with USA Swimming. The Waves participate in age group meets as part of the Coastal Division of Southern California Swimming. Swimmers compete against children in their age group (8 and under, 10 and under etc. up to age 19). Our goal is to give swimmers at all levels of ability the opportunity to pursue excellence through personal development, teamwork, sportsmanship, leadership, and strength of character, inspiring them to win with humility and lose with grace. All swimmers may tryout prior to any of our practices. We use 2 pools at Viewpoint School.